When they meet and Dante teaches Aristotle to swim, they laugh over their classical names—their pocho names, they think, because are real Mexicans named after philosophers and poets? Dante has a much easier relationship with his parents and with other people. His parents talk a lot, and Dante is their world. To add to their worries about being pocho, neither Dante nor Ari watches TV. Dante reads poetry and the two of them, though they do like comics, love more difficult works of literature like Joseph Conrad’s Heart of Darkness. They appreciate the same music. In a few words, in spite of how different the boys are, they click. Stereotypes of Mexican American boys be damned. But when Dante tells Ari that he ‘likes to kiss boys’ and that Ari is the boy he most wants to kiss, a tension colors their friendship. While Ari’s trying to work through it, he starts to question everything about his life and his family—his brother’s jail term (what did he do? ), his father’s taciturn nature (what happened in Vietnam?). And he’s going to need some answers before things explode. 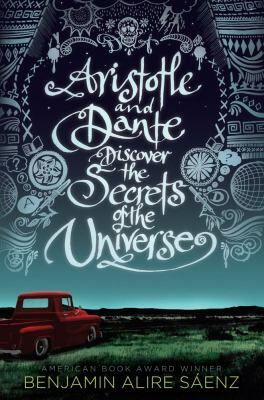 High school housekeeping: Aristotle and Dante Discover the Secrets of the Universe is a very good book. It’s well written and deals with several deep issues—what it means to be a Mexican American guy, what it means to be honest, both with others and with oneself. It is also a book that’s for readers. What I mean by that is that it evolves slowly in small increments, as does life. It’s a book I wish everyone would read. But I also like to be honest with you, and this book isn’t one that will appeal to the guy who hardly ever reads and has a reading assignment, or who is trying to become a more frequent reader. The long thoughts on dreams and nightmares, the viewing each event through a prism and the follow up discussion on its slants of light—you’ll have stopped before you get to the discovery of the universe. This novel will have wide appeal among both gay and straight youth who like a book to be like life—a book whose characters will take their time to arrive at self-knowledge. Who, finally, discover the universe within. This entry was posted in Family Problems, Fiction, Human Rights Issues, Romance, Young Adult Literature and tagged family problems, gay youth, GLBTQ, LGBTQ, love, Mexican American youth, Mexican Americans, post traumatic stress disorder, PTSD, romance, Vietnam veterans. Bookmark the permalink.